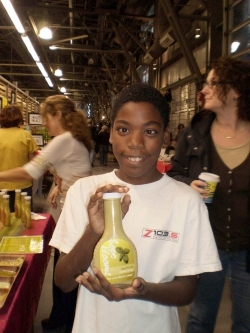 HALIFAX—Eleven-year-old Craig Cain eagerly shakes bottles of Hope Blooms salad dressing and pours them into dishes for a potential customer to taste. He tells the customer his favourite flavour is Creamy Dill and Garlic, and smiles widely when a purchase is made. It is 7:45 on a Saturday morning. At one point, when offered a $20 bill for a $6 bottle of salad dressing, he pauses and asks, without guile, “Do you need change for that?” He is eager. So eager, he happily got up two hours earlier that morning to volunteer to sell salad dressing. Cain is one of almost 40 kids who work on a youth project at the North End Community Garden in Halifax, and who, with the help of sponsors and the program’s organizers, have started a registered charity and a business: Hope Blooms. The majority of the money from the business goes into a scholarship fund for the young people; the rest goes to a community charity. “First we pick the stuff from the garden, then we take it in, then we clean it, then we spin it, then we cut it, then we put it in the blender with the other ingredients and then we pour it into the bottles.” Cain has been working in the garden for two years. He has learned how to grow plants and how to make salad dressing. He says it’s a lot of fun. “Sometimes we have to start over again [after the garden is vandalized],” says eight-year-old Folayemi Boboye. “We may have to make more compost and start growing again.” Boboye has a unique view on the garden: she says it is patient. “I think it’s the kids who are patient,” counters Chen. “We have to have patience and help the garden.” They agree, however, that, like all of us, the garden needs to take time to grow. It needs someone to take good care of it. Jillian Martin, who works at the North End Community Health Centre, has noticed a difference in the young people’s commitment to taking care of their garden and their business. Each year, their willingness to show up and work hard improves. “Now that they know what it’s all about,...as soon as they get there, they’re ready to work,” says Martin, who describes her role with the garden as a manager of operations. The kids also love the business camp BBI hosts each year. At the camp, the children learn important points of running a business. They learn “entrepreneurship...and the value of making a product, selling it, and feeling proud of yourself for doing your own thing” says Martin. Cain says he is learning how to count change, how to sell, and that sometimes it’s important to get up really early. Cain wants to start his own line of salad dressing when he grows up. He wants to be a business man. Boboye eats a lot of vegetables now too. She takes what she grows home to her mother. “My mom always makes some salads and they’re really good.” She says she has learned that it’s important to eat good, healthy food. Last year, the youth shared their proceeds with ARK, a shelter for street-involved and homeless youths. “They’ve been developing a sense of making money, and giving it back to the community.” This year, they will choose another organization with whom to share their proceeds. “It means a lot to me to see positivity coming into the neighbourhood...the community gets a really negative rap sometimes from the media,” says Martin. Jollymore says that the whole project is about the kids having a sense of empowerment regarding their futures. It’s also about spreading that sense of empowerment throughout the community. Cain wants to see more people from his school come to the garden and help out. “They don’t get paid to come here, they don’t get paid to make [the salad dressing],” says Martin, but they come anyway. A greenhouse is in the process of being built so herbs for the salad dressing can be grown all winter long. It looks like the business will keep flourishing. So far, Hope Blooms has sold out every week they've set up shop at the market. Charlene is a freelancer and a recent graduate of Journalism at King's. She holds a BA and MA in English literature. She works as a Junior Program Officer at Imhotep Legacy Academy.